Here are some facts about the box jellyfish. The box jellyfish is an extremely toxic and dangerous species of jellyfish. It is also known as the fire medusa, sea wasp, boxfish or stinger. Despite its name, the box jellyfish is a domed umbrella shape, rather than strictly square or box like. A flap on the underside allows it to move quickly, at speeds of up to 18 feet per minute. It is found off the northern coast of Australia, in the Indian Ocean and the west Pacific Ocean. The box jellyfish is most active and dangerous during the wet season, which runs from November to April. Because the box jellyfish is light blue and transparent, it is almost invisible in the water. For many years, Australian swimmers did not know what was biting them and causing the pain. The box jellyfish has up to 15 tentacles, each up to 10 feet in length. On each of these tentacles are 5,000 stinging cells which are triggered by the chemical presence of its prey. The jellyfish has 24 primitive eyes. It is able to effectively avoid obstacles and swim in one direction, even though it has no central nervous system. The venom of the jellyfish is one of the deadliest in the world. It attacks the nervous system and the heart and can cause intense pain for weeks, or lead to cardiac arrest. One way to treat stings is to pour vinegar on the tentacles and affected area of the body. Many beaches in Australia have bottles of vinegar on hand for jellyfish stings. Although the sting is deadly to most creatures, sea turtles are not affected by the venom. 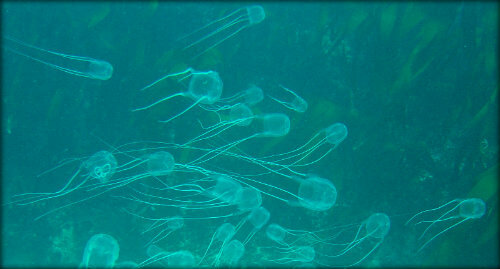 They eat the box jellyfish as part of their regular diet. There are at least 36 species of box jellyfish. Actually, health professionals no longer advise people to use vinegar on jellyfish stings. While it does neutralize active stingers, it also REACTIVATES the dormant ones, which increases the amount of venom released into the body. When dealing with such deadly venom, victims definitely do NOT want to do anything to increase the amount in the body. I hope this helps, if someone who reads this is stung. The best practices include not swimming alone, heeding warning signs posted at beaches, and administering CPR if necessary. Note: Putting pressure on the affected area is also NOT recommended, as it actually drives the venom deeper into the body. Be safe, everyone, and I hope you never encounter these creatures! P.S. If you, or someone you encounter, does get stung, it’s vital to get help from emergency personnel immediately. The venom has the potential to kill within 3 minutes, so don’t delay calling an ambulance. They have antivenom on hand which can save lives.